– Cadillac was formed from the remnants of the Henry Ford Company when Henry Ford departed along with several of his key partners and the company was dissolved. With the intent of liquidating the firm’s assets, Ford’s financial backers, William Murphy and Lemuel Bowen called in engineer Henry M. Leland to appraise the plant and equipment prior to selling them. Instead, Leland persuaded them to continue the automobile business using Leland’s proven 1-cylinder engine. Henry Ford’s departure required a new name, and on August 22, 1902, the company reformed as the Cadillac Automobile Company. – The Cadillac automobile was named after the 17th century French explorer Antoine Laumet de La Mothe, sieur de Cadillac, who founded Detroit in 1701. – Cadillac was purchased by the General Motors conglomerate in 1909. Cadillac became General Motors’ prestige division, devoted to the production of large luxury vehicles. In the United States, the name became a synonym for "high quality", used in such phrases as "the Cadillac of watches," referring to a Rolex. In English usage outside North America, other brands are used in such phrases – usually Rolls-Royce. – The Cadillac line was also GM’s default marque for "commercial chassis" institutional vehicles, such as limousines, ambulances, hearses, and funeral home flower cars. The latter three of which were custom built by aftermarket manufacturers: Cadillac does not produce any such vehicles in factory. – This ’52 Fleetwood Series 60 Special Sedan was a self-contained Series, designed by Bill Mitchell. 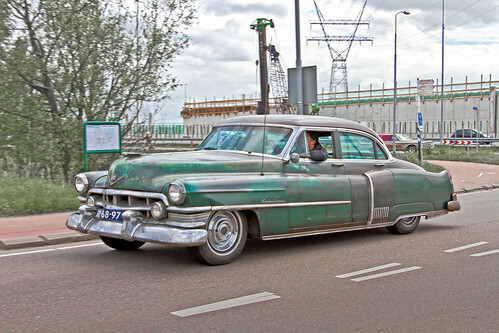 – This fourth generation Fleetwood Sixty Special (1950-1953) was assembled in Detroit (Michigan).